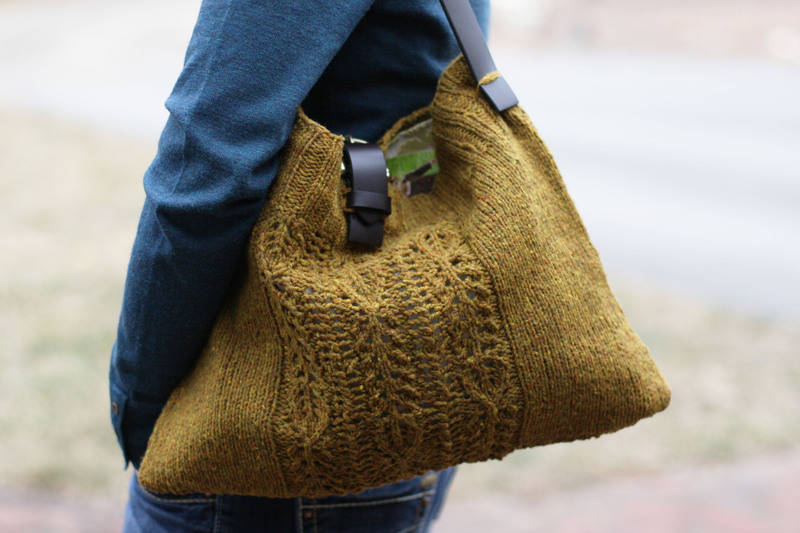 I started Peabody, with Jared Floods Shelter yarn, way back in October, when we began this blog. I fell out of love with it, and it has sat idle for months. 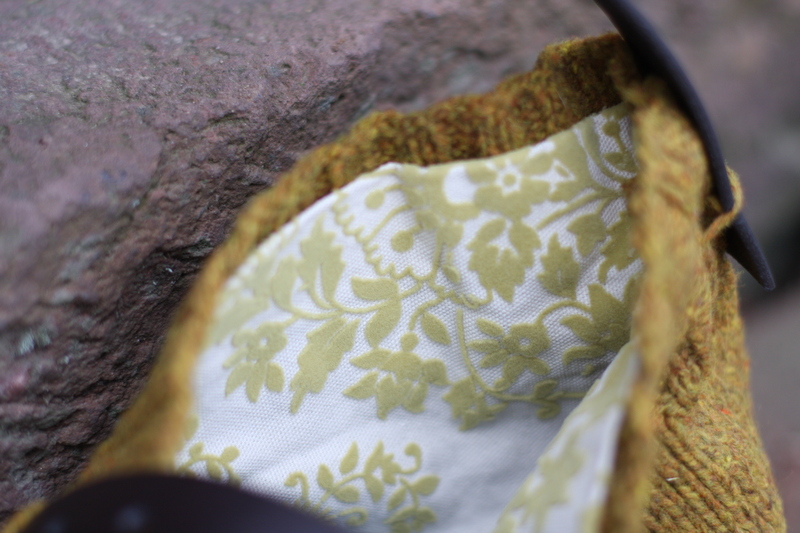 My plan was to rip out my hard work, and reuse the yarn for my Garasole afghan. 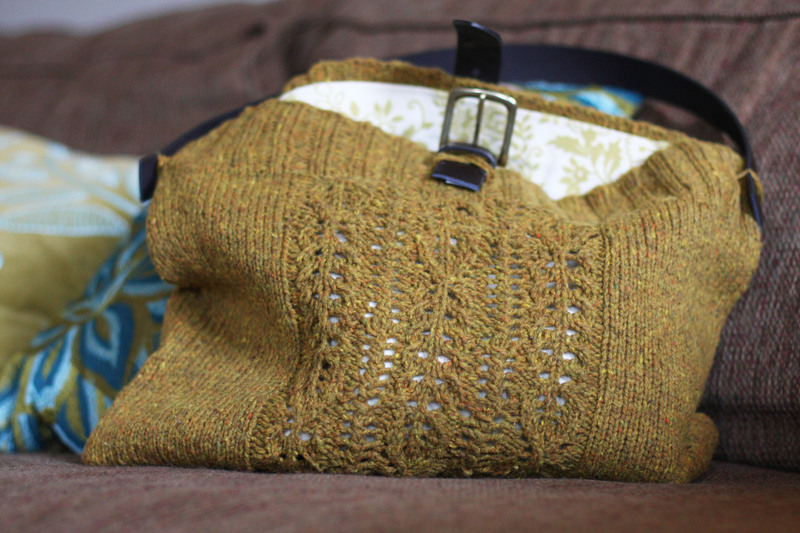 I was having a hard time actually ripping it out, and had an idea to use the sweater as a hand bag. I am so glad I did not rip it out! 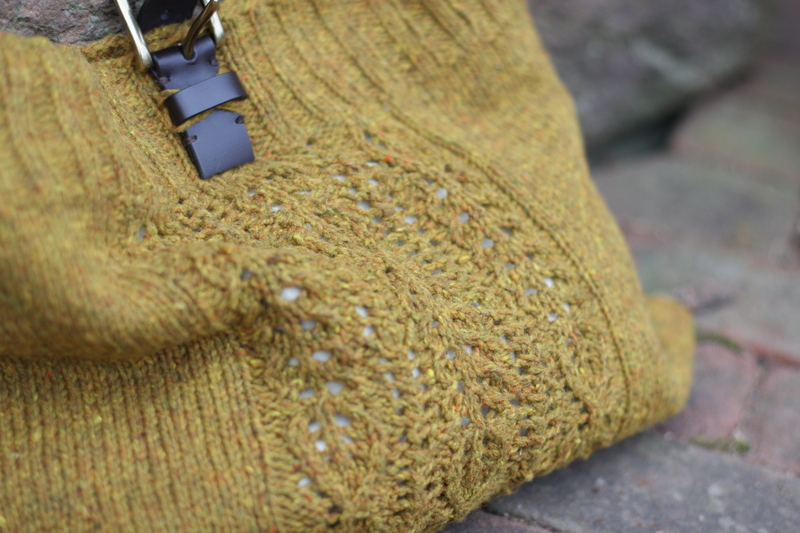 The sweater was knit in the round, so all I had to do was sew up the bottom seam! 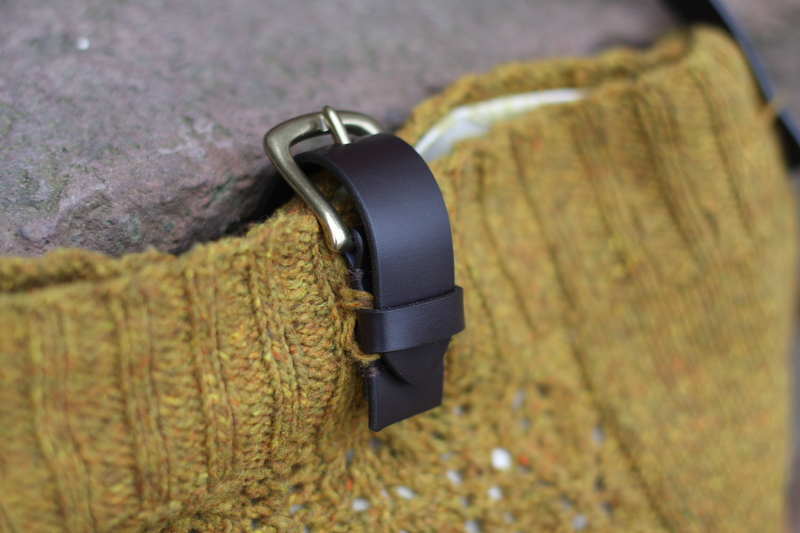 Then I used my boys leather belt from the Gap to make a strap, and the buckle for a clasp. (Ry was worried about his belt, but I know where to get another.) I had some of my favorite material laying around so I lined the bag with that. Darren spent the day yesterday, sick with the stomach bug. I know, similar to last week! When I can get out of the house again, I am all ready to go! Came out so good! So glad you didn’t rip out all that work! Makes a neat one of a kind bag only you will have! How’s the big guy today? It turned out great, Katie!! Are you kidding me???? That is so cute!! Love it! Looks awesome Katie, I love it!! You are so creative. Wow! This is fantastic! And so creative on the hardware and handle. you are amazing! I love it…so glad you didn’t rip it all out! 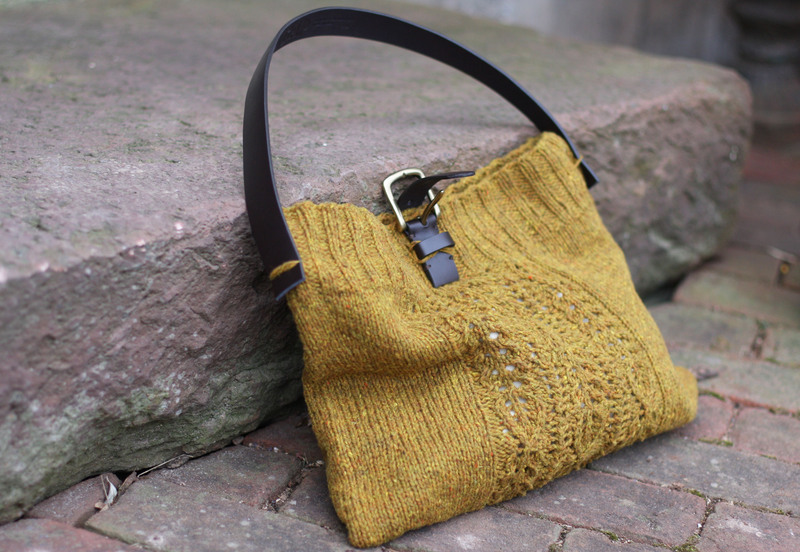 Katie, I am sooo insane about this bag. Love, love, love. Love your new purse! So clever, including the belt idea. Wow – so super cute! 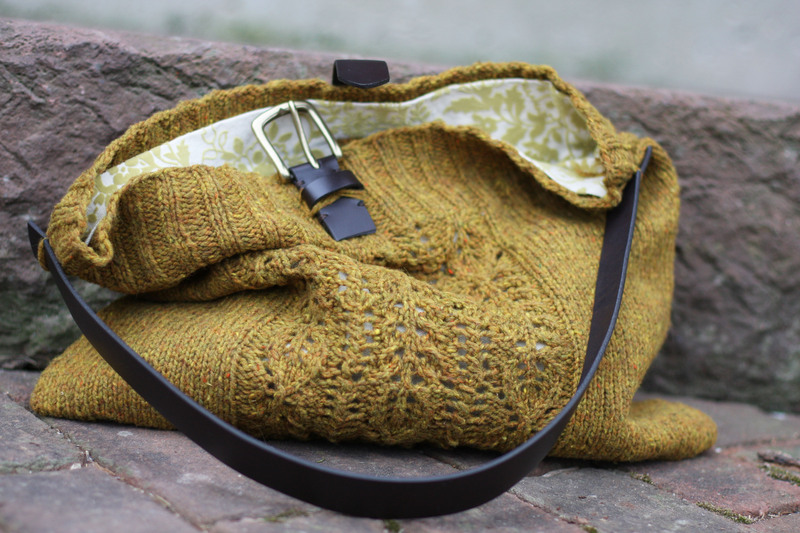 And super creative, I hate ripping projects out – such hard work all wound back up – nice way to get around it with a awesome new purse! brilliant lady!! just brilliant :-) love the bag! I would be curious to know how you secured the handle and closure. A tutorial perhaps? That is the cutest bag ever! Love it! Awesome! Love the color combo! I saw this on Pinterest and wanted to stop by and tell you how wonderful it is! I don’t knit but I have an old sweater that I’d like to try this with. Thanks for sharing it! What a great idea! I’ll have to keep this in mind for any future projects — better than being set to “zzz” for years on end!